I wonder what most of us are thinking more about - Thanksgiving, or Black Friday. I'm hosting a small family feast this year, and my vegan menu is pretty extensive, largely experimental, and probably more labor intensive than I think it will be. That's where my energy is going this week, from list making, to recipe notes, to shopping and prepping ahead wherever I can. I'm excited to be doing all this, so it's not a chore. I'm thankful that I can do all this, and I'm doing it because I want to. The Taos Folk Holiday Show that I'm in starts Friday though, and even though I thought I was prepared for it, it's taking up more of my time this week than I want it to. Set-up is not the streamlined event I'd imagined. I was led to believe I would drop my inventory off yesterday, and the show's designer would display it artfully for me. Not so... I don't even want to go into the details, but I will say I spent several hours there yesterday, doing and re-doing my display, and have to go back again today. I'm kind of not thrilled, but I'm in for the ride, and I just have to trust it will all work out perfectly. It always does, right? I really just want to get it all done so I can get back to Thanksgiving, the Holiday at Hand, and give it its proper attention and reverence. I don't want to think about Christmas yet, and all it implies, particularly the list of things I "have to" do. Admittedly, my list gets shorter every year. I don't send cards, I don't give gifts to anyone but my kids, and they get less and less each year. I'm sure I'll be cooking a lot, but as for the rest of it, if it's something I'm expected to do, I'll probably rebel. I saw something yesterday that made me want to do it because I don't have to. 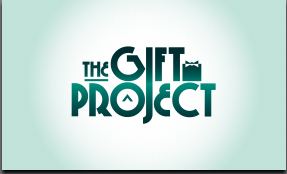 It's called the Gift Project, and from the looks of the website, it's a brand new baby. The idea is to give small (or large), unexpected gifts to strangers, or people you know, along with a little card you can print from the website, and maybe a note explaining that the one who is gifted is supposed to pass the card, and a gift of some sort, along to someone else. It's a Pay-It-Forward-Random-Acts-Of-Kindness sort of thing, all nice and fresh and shined up. I read on Facebook that a friend had been treated to lunch by the man in line ahead of her at Subway, and was handed the little card along with her sandwich. It was a small thing, but it made her day, and inspired her to do something, probably many somethings, for someone else. I recently received an Amazon gift card from a bead customer friend who wanted to give me a creatively inspiring book, but didn't know what I'd like. It was wonderful, it made me so happy I cried, and mostly it made me feel valued and cared for. How lovely when someone does something kind because they want to, not because they have to. I'm in. I'm printing cards today and going out into the world to see what kind of Gifting Mischief I can get myself into. As soon as I finish the have-to list for the show, I'll get right back to being in the Holiday Moment, thankful to be able to do small things for others... simply because I want to. And while I hope people will show the show, my real attention isn't going there just yet. I have other things to do. Isn't the Gift Project thing fantastic?!?!? I'm still reeling over getting a free lunch the other day. Cards are printed and I've already done one give away. Many more to come this holiday season. I hope you and your family have a fantastic Thanksgiving. Mwa! !